Located in Cambridge, our dreamy location overlooks the Charles River and provides a tranquil urban oasis not far from the action. We offer the best of both worlds since we’re only a short 10 minute-walk from desired destinations like Kendall Square. 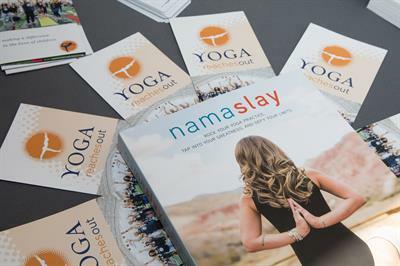 Come together in celebration for International Yoga Day at the Kimpton Marlowe Hotel with Candace Moore of YogaByCandace®. We will have unique classes all day, led by the famous Yogi herself! Come to one or come to all. Portions of the ticket sales will be donated to Hands to Heart Center. 6:30 am – 7:30 am – Morning Sunrise Yoga – Kimpton Marlowe Courtyard: Come to class ready to be inspired! This slow flow vinyasa class is rooted in heart-opening, mood-lifting, feel-good poses. Appropriate for all levels, you can expect to leave feeling revived and uplifted so you can tackle the day ahead. 12:00 pm – 1:00 pm – Paddleboard Yoga – Canal Park: Get out of your comfort zone and try something new! This is a gentle yoga class, that will begin with a guided meditation and breathing practice. From there, we will gently stretch the entire body through a series of hatha yoga poses. Hatha yoga means that we'll be breathing deeply in each pose, going slow, and aiming for relaxation. Join us on the water for great views, a cool ambiance, and a dose of relaxation and rejuvenation through our hatha yoga practice. Paddleboards were generously donated by Paddle Boston. 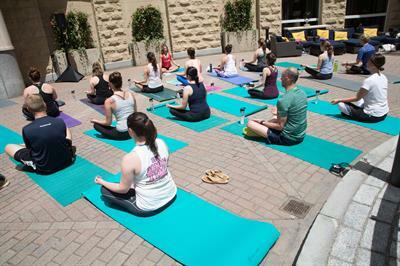 5:30 pm – 6:30 pm – March To Your Beat Yoga Groove – Kimpton Marlowe Courtyard: This outdoor power vinyasa yoga class will be set to live music from local artists, creating one of the most unique experiences you'll ever have on the mat. You can expect a sweaty, creatively sequenced power vinyasa yoga class appropriate for all levels. 7:30 pm – 8:30 pm – Hip Opening Aromatherapy Yoga Class – Kimpton Marlowe: This hip opening yoga practice is excellent for athletes or people who sit for long periods of the workday. You can expect long stretches, combined with aromatherapy that will leave you feeling limber and relaxed. Appropriate for all levels. 9:00 pm – 10:00 pm – Blacklight Flow and Glo Yoga Class – Kimpton Marlowe: This yoga class will take place in a dark room with blacklights, so feel free to dress the part and wear neon or light colors to be apart of our funky vibe! The upbeat vinyasa yoga class will have you laughing, sweating and grooving your way to the best version of yourself. Appropriate for all levels. Raffle tickets will be on sale for a variety of items all day. The winners will be announced following the event and mailed to the winners. Proceeds from the raffle will directly benefit Hands to Heart Center. Please consult a medical practitioner before starting any new exercise regime. This is particularly important if you are overweight, pregnant, nursing, regularly taking medications, or have any existing medical conditions. We cannot offer any medical advice during these sessions. Hands to Heart Center is a volunteer-run, nonprofit organization that shares the healing practice of yoga with people affected by addiction, poverty and trauma in Greater Boston. 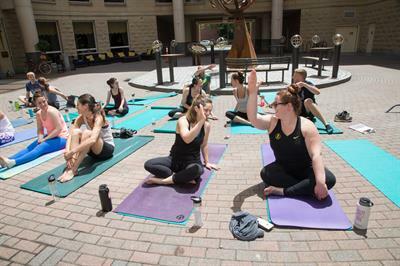 Since 2014, Hands to Heart Center's Community Yoga Teachers have provided over 1,800 free, customized yoga classes in branch libraries, community centers, domestic violence shelters, high-poverty schools, homeless shelters, prisons, public housing developments and substance abuse treatment programs. For more information, please visit www.handstoheartcenter.org, like us on Facebook at https://www.facebook.com/handstoheartcenter/ or follow us on Twitter @Hands2HeartCtr.